The day the members of Boston quartet Sons of Serendip walked into Madison Square Garden to audition for “America’s Got Talent,” a basketball tournament was also taking place. “This lady said to us, ‘Basketball is that way.’ We were like, ‘No, we’re here to play music,’’ said 6-foot-3-inch vocalist Micah Christian with a laugh. The Randolph resident is a former missionary who spent a year in Peru teaching impoverished children. His Facebook photo shows a small Peruvian child clinging to his arm, literally lifted up, dangling from Christian’s bicep. While the photo explains why Christian might be mistaken for a basketball player, it’s also a symbol of what he and his bandmates aim to do on the NBC show Tuesday night at 8. “Our hope is that our music lifts people up,” said Christian, a 2006 Stonehill College grad who went on to earn his master of divinity degree from Boston University in 2012. 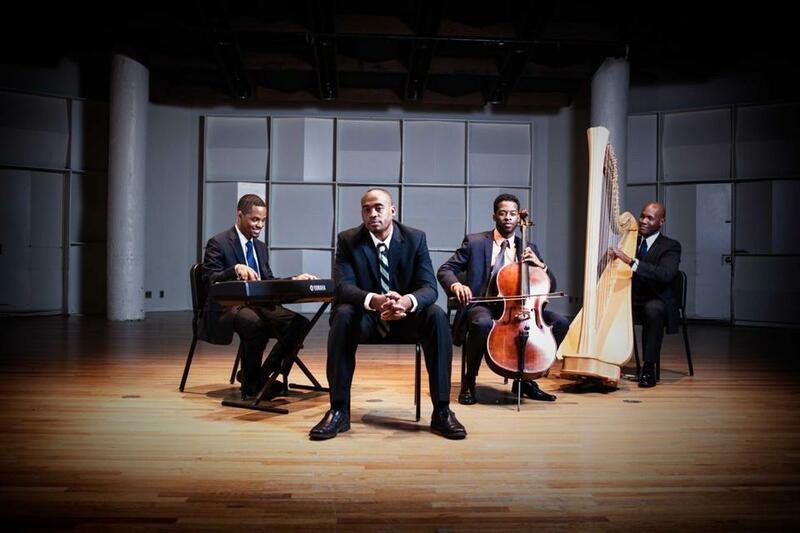 In addition to Christian, the Sons of Serendip are pianist and guitarist Cordaro Rodriguez, harpist Mason Morton, and cellist-composer-vocalist Kendall Ramseur. The four met at BU. The quartet evidently moved Howard Stern, Heidi Klum, Howie Mandel, and Melanie Brown — the “America’s Got Talent” judges. The group was one of some 100,000 acts to audition for the show. Fewer than 50 acts were selected, according to Christian. Hosted by Nick Cannon and produced by Simon Cowell, the show returned for its ninth season May 27. Unlike other performance competition shows like “The Voice,” “America’s Got Talent” isn’t just for singers. It’s more of an old-school variety show, showcasing singers, dancers, comedians, contortionists, and other offbeat acts all vying for a $1 million prize — and a chance at fame. But the Sons of Serendip are looking for something a little longer-lasting than their 15 minutes. “We hope our music resonates deeply with listeners, and that in some way, it helps to make their lives a little better, even if just for a moment,” said Christian, 30, a teacher at the New England School of English in Cambridge. He married his Stonehill sweetheart, Jocelyn Vierra, in 2010 and had vague plans of becoming a missionary or pastor when he started at BU. But while interning at the university’s campus ministry office, he met Rodriguez, a BU law student and a North Carolina native. Rodriguez, 27, a pianist and music producer, graduated from Princeton in 2008 and spent a year volunteering in Ecuador before law school. “When I was 9 or 10, when church was over, I’d sneak up to the piano and tinker around. Someone at my church saw that one day, and gave me a keyboard. I kept . . . playing it; my dad saw that I had picked it up quickly, so he invested in a full-length keyboard,” he said. At BU, Rodriguez reconnected with an old childhood friend from Charlotte — Ramseur, a composer, cellist and music teacher who was earning his master’s in music performance. “Cordaro and I grew up a block away from each other, went to the same elementary school, same middle school. When I moved here, I didn’t even know he was in Boston,” said Ramseur. Morton, 26, earned a degree in harp performance from Rice University but didn’t have a place to live when he came to Boston to start his master’s degree in music studies at BU. He ended up rooming with Ramseur and Rodriguez. Sons of Serendip came together in March, when Christian rallied the others to audition for “America’s Got Talent” after he turned 30. Lauren Daley, a freelance writer, can be reached at ldaley33@gmail.com.